Donating to the library is easy! Please only one box of donations. Let staff know you are donating, we have the container and we will bring it out. no water damage, or visible stains. If you are bringing book donations, please come in and let the staff know. Then pull around to the side of the building at the staff door to unload them. Depending on staff at the time, we may not be able to deal with heavy loaded boxes, and we need to inspect them before we bring them in. Please understand, we cannot be a drop off for books you find hard to place. If they have been stored in your mom's garage for an extended period of time, they probably are not going to be usable. We can only place attractive and current books on our shelves. If they are old, then we will only dispose of them. Save us some time and do this yourself. There is a recycling company in Nederland, Texas or you can call other area libraries. If the materials do not meet our collection development policy and we cannot use them on the shelf, we will save them for our book sale. 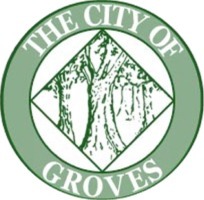 We cannot promise to return them, once they are left, they become property of the City of Groves and the library. We will used them to the best of our ability. We can give you a receipt for the number of books you donate, however we cannot furnish you with a dollar amount.